In our September 4th, 2018 ETF Manager Comment “HFMU.U Outperforms U.S. Large-Cap Financials in Year #1 Rising 15%, Despite Two Formidable Obstacles” we discussed the performance of the ETF in its first year. However, as a follow up, we thought it would be helpful to address risk and volatility of returns. Using monthly data, the U.S. Large-Cap Financials index declined 5 straight months (February to June) while the maximum number of down months for HFMU.U were significantly lower at just two months. 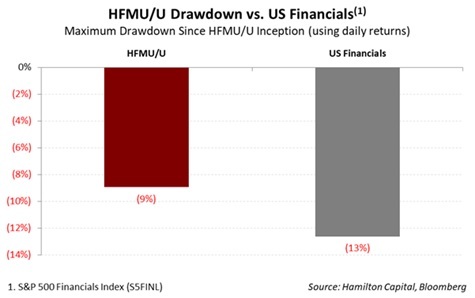 Using daily data, the chart below shows maximum drawdown for HFMU.U since inception is 400 bps less than the U.S. Large-Cap Financials Index.